In case you haven't heard, the massive Large Hadron Collider in Geneva Switzerland had its first proton collisions over the weekend after shutting down last September. This means that the world's largest most complicated machine is now back, and ready to search for the hypothesized Higgs boson, the particle theorized to give matter its mass. The LHC is on record as the world's largest and most powerful particle accelerator. Not only that, it really is the world's largest and most complex machine. When running at full power it shoots lead ions around its 27 km long track at almost the speed of light. The ions collide with such energy, that new particles are created under conditions similar to just moments after the Big Bang. It’s the hope of physicists around the world that one of the particles that flies off into the detectors is that hard to pin down Higgs boson. Author Bill Bryson visited the collider a few weeks ago while it still under repair. He spoke to CERN physicist James Gillies who put the machine's astonishing precision into perspective, "[G]etting two protons to collide is exactly equivalent to firing two knitting needles from opposite sides of the Atlantic Ocean and having them strike in the middle." Its accident last September, just days after its commissioning, was a major setback. 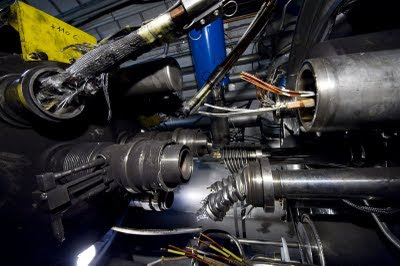 Faulty wiring caused six tons of the collider's liquid helium to destructively discharge, knocking 54 of its superconducting magnets out of alignment. Technically speaking, it was really bad. Over at The Big Picture photo blog, Alan Taylor put together an amazing series documenting the damage and repair of the massive machine. 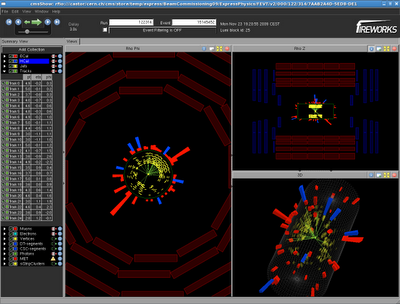 Now it's back up and running, and gearing up to hunt for the Higgs. 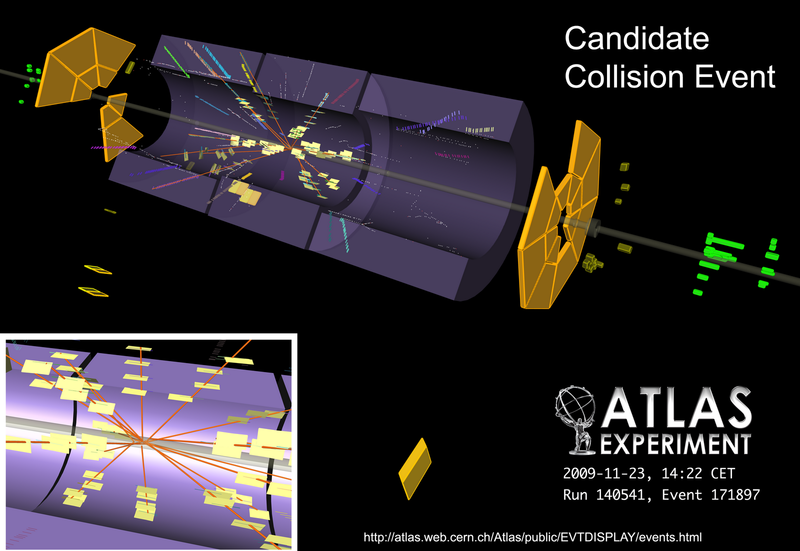 These initial collisions are really just baby steps, a fraction of what the collider can do. Not surprisingly, the scientists are being careful as they ease the machine up to full power, but they are still making fast progress. These collisions came only three days after they shot the first test streams of protons around the collider. To say these collisions are the culmination of a massive effort would be an understatement. The whole experiment cost over $9 billion and took 15 years and countless man-hours to design, build, and run (and repair). However raw numbers really can only offer a small glimpse into how much effort has been put into the massive machine. 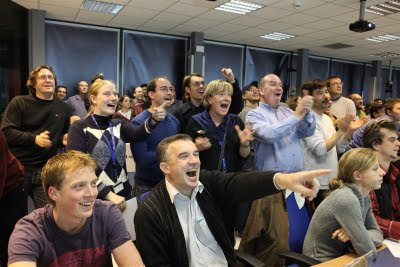 I think the looks on the scientists' faces in the main control room says it all. Like the old saying goes, a picture's worth 1.0 x 10^3 words.